Vox Cantoris: Bishop Schneider call on Pope Francis to clarify to avoid a general confusion - issues stunning rebuke of Amoris Laetitia! Bishop Schneider call on Pope Francis to clarify to avoid a general confusion - issues stunning rebuke of Amoris Laetitia! Bishop Athanasius Schneider has now weighed in on Amoris Laetitia calling on Pope Francis to issue an "authentic interpretation," for which another interpretation will most likely be required. He has asked the Pope to declare the "principle of the infallible Magisterium" on the issue of adulterers receiving Holy Communion. "The See of Peter, that is, the Sovereign Pontiff, is the guarantor of the unity of the Faith and of Apostolic and Sacramental discipline. Considering the confusion that has arisen among priests and bishops in the sacramental practice with regard to the divorced and remarried and in the interpretation of AL, one can consider as legitimate an appeal to our dear Pope Francis, the Vicar of Christ and "the sweet Christ on earth "(St. Catherine of Siena), to order the publication of an authentic interpretation of AL, which should necessarily contain an explicit declaration of the disciplinary principle of the infallible Magisterium regarding the admission to the sacraments of the divorced-remarried, as formulated in the n. 84 of Familiaris Consortio." He is quite clear that some or much of AL is open to false interpretation and that the document breaks from Divine Law in the Sixth Commandment and the very words of Our Lord Jesus Christ Himself. Reading his words, 6000, about 10% AL, is invigorating, it is Catholic unlike what has issue forth from the Pope, the most verbose, obtuse and destructive piece of bile ever issued from the Vatican. Pope Francis must be held accountable by the bishops and lay faithful for his grievous error in this wretched document. These malefactors can never be part of any sacred hierarchy of the Church and that includes the Bishop of Rome himself if he fails to teach and sanctify and rather, allows this travesty to stand. They will get no respect from this writer while they actively engage in auto-demolition of the faith. One can imagine his indigestion at breakfast this morning. Bishops, speak up or be damned! How Pope Francis responds should be very telling! Amoris Laetitia, within and without the Church, has all but been reduced to the issue of Holy Communion for divorced and "remarried" Catholics. His Holiness Pope Francis made it clear during his recent press conference that that has left him frustrated. He referred us to Cardinal Schonborn's presentation of Amoris Laetitia to grasp the meaning of the Exhortation. Pope Francis' response would be fine if it were merely Blogger "X" or some news media outfit who claimed that the Exhortation opened the door for Communion to divorced and "remarried" Catholics. The Pope wouldn't need to waste his time responding to that situation. However, the big question about Communion for divorced and "remarried" Catholics is not limited to that inconsequential situation. The mammoth and grave problem in regard to Amoris Laetitia is that there are bishops, the Church's authorized teachers of the Faith, who have insisted that the Exhortation has opened the door to Holy Communion for divorced and "remarried" Catholics. It is bad enough that various priests and theologians have portrayed Amoris Laetitia as a revolutionary document. But far more alarming than that is that bishops have portrayed the document as having changed Church doctrine. That is the main reason I believe that Pope Francis must address now, immediately, the controversy that has plagued Amoris Laetitia. It doesn't matter that Pope Francis believes that, via Cardinal Schonborn's presentation of the Exhortation, the key to deciphering Amoris Laetitia is available readily. The grave problem is that various bishops have offered interpretations of Amoris Laetitia that differ radically from each other. Pope Francis, if he wishes for his flock to hear Jesus Christ's crystal clear truth in regard to marriage and Communion, must not permit that situation to stand. Pope Francis must state definitively that the Church's teaching on that issue stands. On February 17, 2016 A.D., Pope Francis stated clearly that (unrepentant) divorced and "remarried" Catholics may not receive Holy Communion. Pope Francis must repeat that clear teaching immediately and publicly to place a halt to bishops who have said otherwise ever since the Exhortation was released. And in advance...could we call for a clarification of the clarification ? Thank the Dear Lord for this wonderful, holy Bishop!! May God give him the grace of courage in confronting errors within the Church, and may St. Michael the Archangel protect him from his enemies, of which I am sure are MANY! I am a tad fearful for him. Grateful thanks to Bishop Schneider for his forthrightness in calling Pope Francis to unambiguously answer the vexed question - can the divorced & remarried now be admitted to Holy Communion while still in a state of mortal sin? No if or buts, just a simple response of Yes or No is all it takes. If he is not prepared to provide such clarification then he is not evidently equal to the Petrine Office and should resign. Let's hope we hear from him very soon as Amoris Laetitia is damaging the reputation of the See of Peter. "Nor can we pass over in silence the audacity of those who, not enduring sound doctrine, contend that “without sin and without any sacrifice of the Catholic profession assent and obedience may be refused to those judgments and decrees of the Apostolic See, whose object is declared to concern the Church's general good and her rights and discipline, so only it does not touch the dogmata of faith and morals.” But no one can be found not clearly and distinctly to see and understand how grievously this is opposed to the Catholic dogma of the full power given from God by Christ our Lord Himself to the Roman Pontiff of feeding, ruling and guiding the Universal Church." I am afraid it is too late to bolt the door! And so, if the current Pope is leading his flock off the spiritual cliff and into the depths of hell, we must what.....OBEY HIM?? I don't think so. Send resume to Post Office Box xxxxxx. We often forget about the Divinely endowed AUTHORITY of the Pope as the supreme Teacher on Earth. "In fact, Venerable Brother, you are not ignorant of the truth that nothing should be nearer to a Catholic Bishop, nothing is more obligatory for him, than heartfelt respect for the supreme power of this Chair of St. Peter, whence flows sacerdotal unity, the ordination of bishops, and the government of the Church; than to defend with all his strength the rights of this See and to honor them, splendid as they are with an authority, not human, but divine; than to attach himself firmly to the Sovereign Pontiff, to recognize him, faithfully to render to him all respect and obedience, this Pontiff, placed in this See, who has received from Our Lord Himself in the person of the Blessed Prince of the Apostles, all power to feed the sheep and the lambs, to confirm his brethren, to rule and govern the whole Church throughout the world." If Francis is Pope, then Catholics WILL submit to him under pain of mortal sin and schism. Full stop! Dear TLM, A Pope cannot lead his flock into the abyss - that is impossible, or Christ would be a liar. The Catholic Church is indefectible i.e. immutable; it can only teach Truth; it is prevented from teaching error by the Holy Ghost, therefore its Teachings are Infallible. The Pope teaches by and with the Authority of Jesus Christ, Himself. Our Lord gave the Keys of the Kingdom of Heaven to St. Peter and his successors. What the Pope, by Divine Authority, binds, or looses on Earth, is bound, or loosed in Heaven. Those are the words of God, Himself. All the above is Catholic dogma. To deny any of the above, is to sever one's membership of the Mystical Body of Christ and no longer be Catholic. The Pope teaches by Divine Authority and we OBEY as we would obey Christ, Himself. If Bergoglio is leading you to the abyss, then there is an obvious explanation - Bergoglio CANNOT be a true Pope, because a true Pope COULD NOT do that. There is no other explanation. But to recognize him as true Pope and then to disobey him, is the definition of schism and is absolutely contrary to Catholic doctrine. Bishop Schneider is very courageous indeed. He knows exactly what he's up against. 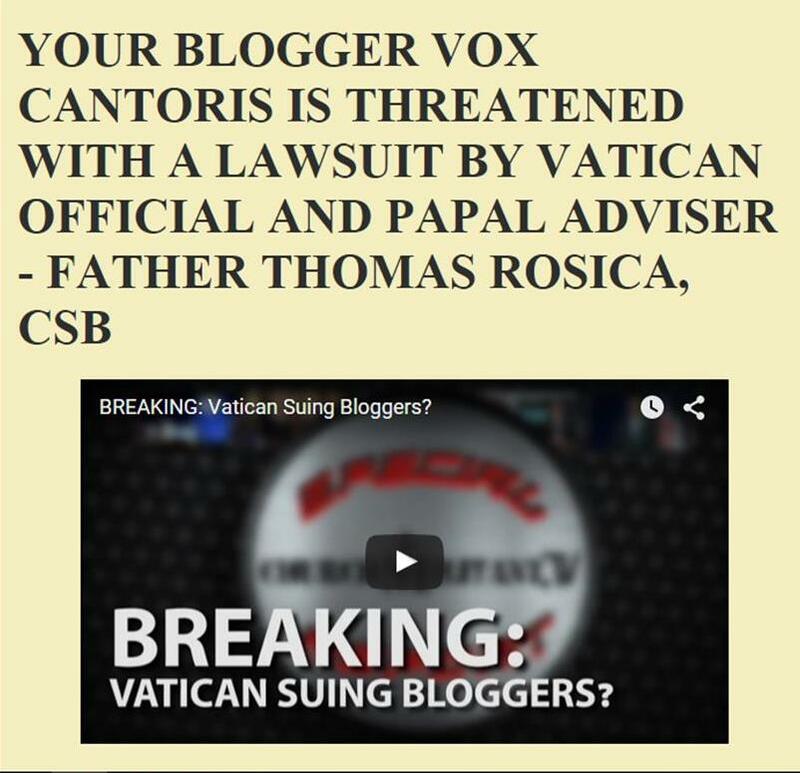 "If Bergoglio is leading you to the abyss, then there is an obvious explanation - Bergoglio CANNOT be a true Pope, because a true Pope COULD NOT do that. There is no other explanation." Peter Lamb. I agree with this. And nowhere is it written that Christ ordered us to follow the Pope into the abyss. We were give minds and free will which we are required to use. The tremendous problem that Bishop Schneider faces is that the overwhelming majority of his brother bishops do not share his understanding of the state of Holy Mother Church. The majority of bishops continue to adhere to the party line that thanks to Vatican II and the liturgical revolution, the Church is in the midst of a liturgical and spiritual springtime. On December 17, 2010 A.D. during a theological conference in Rome, which included Cardinals and bishops, Bishop Schneider called for a new Syllabus that would condemn the misinterpretations of Vatican II. Pope Benedict XVI failed to act upon Bishop Schneider's plea to the Church. The overwhelming majority of bishops failed to respond to Bishop Schneider's plea to the Church. Today, one bishop after another has pronounced Amoris Laetitia orthodox, beautiful, and very clear in its teaching. Conversely, certain bishops have insisted that the Exhortation opened the door to Communion for divorced and "remarried" Catholics. Nevertheless, there simply has not been a call among the first group of bishops for His Holiness Pope Francis to clarify Amoris Laetitia. Again, the bishops in question don't believe that there is a need to clarify Amoris Laetitia. They believe that the document is orthodox and clear in its teaching. Finally, the man who counts the most in this situation is Pope Francis. He stated stated publicly (February 17, 2016 A.D.) that divorced and "remarried" Catholics are forbidden to receive Holy Communion. Beside that, Pope Francis responded to the question about the Exhortation and Holy Communion for divorced and "remarried" Catholics...he informed us to reference Cardinal Schonborn's presentation of the Exhortation to obtain that answer. When presented with the golden public opportunity to clarify Amoris Laetitia, Francis failed do so other than to have referred us to Cardinal Schonborn's presentation of the document. On top of that, Pope Francis has at times rejected the notion that his (Pope Francis) teachings are unclear. He said that he teaches via Encyclicals, Exhortations, sermons, addresses, and various public comments. He declared that that is "teaching". He has insisted his teaching is clear and available to anybody who pays attention to his documents and public statements. Perhaps Pope Francis will respond to Bishop Schneider's respectful call to clarify Amoris Laetitia. Perhaps in time many bishops will promote Bishop Schneider's respectful call for clarity in regard to Vatican II. But I don't know...we'll see. Who have eyes and do not see, who have ears and do not hear. 3 and said, “Amen, I say to you, unless you turn and become like children, you will not enter the kingdom of heaven. 5 And whoever receives one child such as this in my name receives me. 25 At that time Jesus said in reply, “I give praise to you, Father, Lord of heaven and earth, for although you have hidden these things from the wise and the learned you have revealed them to the childlike. 17 Do you not yet understand or comprehend? Are your hearts hardened? 18 Do you have eyes and not see, ears and not hear? And do you not remember? The Bible: Jeremiah, Matthew and Mark. "One word sums up its prevailing message: tenderness." Archbishop J. Michael Miller, CSB, of Vancouver, British Columbia, Canada, has heaped great praise upon Amoris Laetitia. Archbishop Miller's great praise of the Exhortation, that he views as beautiful, much-need within the Church, and orthodox, is far-removed from Bishop Schneider's analysis of Amoris Laetitia. Archbishop Miller declared: "As I read "Amoris Laetitia," one word sums up for me the prevailing message of this beautiful apostolic exhortation: tenderness. "This exhortation addresses those concerns and challenges with a tender tone, a generous spirit, and faithfulness to the Church's teachings on marriage. "The important issue of divorce, remarriage, and the Eucharist will naturally receive much attention. The Pope rightly reminds us that those who are divorced and remarried "need to be more fully integrated" into the life of the Church in a variety of ways. "The Holy Father's recent reform of the marriage annulment procedure addresses the perceived burden of this process. Now Francis calls us as priests and bishops to a fresh approach of personal and pastoral discernment when ministering in these sensitive situations. "I am very grateful to Pope Francis for giving us this exhortation during the Jubilee Year of Mercy, just as the Archdiocese of Vancouver prepares to concentrate more of its pastoral ministry on families. "Amoris Laetitia" is a compassionate and inspiring blueprint for bringing renewed vitality to our families." Dear Greg, I must be the dumb one, because no, I don't see, or hear. My heart's pretty patched up but it's not hard. What's your point? Bishop Philip Egan, Diocese of Portsmouth, England, praised repeatedly by many Traditionalists as a fine, very TLM-friendly bishop, issued this past weekend a letter on Amoris Laetitia. Bishop Egan declared that the Exhortation is 100 percent orthodox, beautiful, helpful, and does not change Church teaching in regard to family and marriage. "There has been no change in canon law." Dear TLM, A Pope cannot lead his flock into the abyss - that is impossible, or Christ would be a liar. The Catholic Church is indefectible i.e. immutable; it can only teach Truth; it is prevented from teaching error by the Holy Ghost, therefore its Teachings are Infallible. The Pope teaches by and with the Authority of Jesus Christ, Himself. Our Lord gave the Keys of the Kingdom of Heaven to St. Peter and his successors. What the Pope, by Divine Authority, binds, or looses on Earth, is bound, or loosed in Heaven. Those are the words of God, Himself. All the above is Catholic dogma. To deny any of the above, is to sever one's membership of the Mystical Body of Christ and no longer be Catholic. This is a sedevacantist caricature of Catholic teaching and is belied by the history of the papacy. Popes can publicly lead the flock into error. They cannot bind the Church to error, but they can certainly teach error. Pope John XXII comes readily to mind. If we had to obey each and every thing that a pope has done/taught, that means Catholics would be required to change their beliefs on the whim of the pope. The Pope Formosus episode demonstrates this without any doubt. Stephen VI was a true pope, so was his predecessor Pope Formosus. Yet Stephen annulled all Formosus' acts, declared him to be an antipope, and declared all the clergy ordained by Formosus to be invalid (thus throwing the sacramental system of the Church into chaos). Theodore II and John IX, both true popes, subsequently contradicted Stephen VI. Sergius III, a true pope, then contradicted Theodore and John. Then subsequent popes, true popes, contradicted Stephen and Sergius. If what you stated were true, which it is not, then Catholics would have been obliged under Stephen to believe that Pope Formosus was an antipope, then change that belief under Theodore and John, and then change back under Sergius, and then change back yet again after Sergius. Pope Formosus was a true and valid pope. End of story. No one was obliged to obey Stephen and Sergius in that regard. They were clearly in error, and the Catholic Church so teaches. 28 “Come to me, all you who labor and are burdened, and I will give you rest. 29 Take my yoke upon you and learn from me, for I am meek and humble of heart; and you will find rest for yourselves. 15 Whoever has ears ought to hear. Dear Anonymous @ 5:37 pm, What I have said is neither caricature, nor is it nonsense. It is in fact irrefutable Catholic doctrine. I do not refer to Papal whims, private opinions, erroneous weather forecasts, or to immoral, or illegal instructions of a Pope, which we all know can and should be refuted with impunity. As you very well know, I am referring to the infallible and supremely authoritative teachings of a true Pope who officially addresses the Universal Church on matters of Faith, Morals, Governance, or Discipline. If you maintain that a Pope can "certainly teach error" to the Universal Church, under the conditions I have specified, you would deny the dogma of Papal Infallibility and the Divine Authority imposed upon the Pope by Jesus Christ. You would then be an heretic apart from the Catholic Church. With the greatest respect, your statement "If we had to obey each and every thing that a pope has done/taught, that means Catholics would be required to change their beliefs on the whim of the pope" does not reflect a proper understanding of Papal Infallibility, or the Indefectibility of the Church. Suffice it to say with regard to Church history that there never was an heretical Pope up to the times of St. Robert Bellarmine, or Vatican I, as both have declared - the latter infallibly. The history of the various Popes you have cited is irrelevant to the present discussion, apart from the fact that none of them were heretics. There have been quite a few "bad", immoral Popes, but not one of them taught error (false doctrine) to the Universal Church. The Holy Ghost will not permit a true Pope to teach error to the Universal Church. To aver otherwise, is to deny the dogma of Papal infallibility - not so? Great advice Greg, but I still don't get the point. Sorry. You will find the second site in totus supports the first, no contradiction, no novel ideas or freemasonic doctrines, just Catholicism. PS. The First Vatican Council declared there had never been a Pope who was a manifest heretic and the total teaching of the Church declares there never can be. What you have posted is a garbled 'history lesson' which places its 'lesson' above what the First Vatican Council concluded. Mark Thomas -- that poor, confused soul, is a veritable poster-child for cognitive dissonance. God bless him. I wonder what contorted, mental gymnastics he would have employed for Popes John XXII, Honorius, Stephen VI, Benedict IX and Leo X.
Pope Francis is about as hard to figure out as a bowl of Corn Flakes. BTW, shortly after it was published, Pope Francis had an opportunity to clarify the question about the Exhortation and Holy Communion for divorced and "remarried" Catholics, but he deflected, informing us to reference Cardinal Schönborn's presentation of the Exhortation to obtain the answer. So what did Schönborn say? "My great joy as a result of this document resides in the fact that it coherently overcomes that artificial, superficial, clear division between “regular” and “irregular”…"
I think I understand Cardinal Schönborn (and the Holy Father). There is no longer a distinction between a licit Catholic marriage and an adulterous relationship. I think we could say Pope Francis is guilty of pastoral heresy not formal doctrinal heresy. In the end I don't think it makes any difference. Either approach leads the lambs astray. Thomas Pernice said..."Mark Thomas -- that poor, confused soul, is a veritable poster-child for cognitive dissonance. God bless him. I wonder what contorted, mental gymnastics he would have employed for Popes John XXII, Honorius, Stephen VI, Benedict IX and Leo X." I don't engage in "contorted, mental gymnastics." As to your digs at me...I am not a confused soul. But I agree that I'm a poor soul. I also didn't realize that I'm the "poster-child for cognitive dissonance." But on second thought, I'll take it. I have never been the poster-child for anything. But if it'll get my face plastered all over in public, and lift from being a nobody, then sign me up. Perhaps I'll go on a world-wide tour. I'll sign autographs. I'll be famous. It'll be on to Hollywood. Movies. Nah...forget it. After all, somebody around here has to wash the dishes and take out the garbage. I'll settle for being a confused soul. But hey, it's something. Thomas Pernice said..."BTW, shortly after it was published, Pope Francis had an opportunity to clarify the question about the Exhortation and Holy Communion for divorced and "remarried" Catholics, but he deflected, informing us to reference Cardinal Schönborn's presentation of the Exhortation to obtain the answer." In fairness to His Holiness Pope Francis, you may believe that he did not clarify the question about Holy Communion, and I may wish that he had responded in this or that manner, but the bottom line is that he responded to the question as he deemed proper. Again, you may not like that. I may not like that. But for better or worse, Pope Francis responded as he had seen fit. "So what did Schönborn say?" The Cardinal said that in Amoris Laetitia, there is "no change", "no break" in Church doctrine. He said that the Exhortation is in keeping with Familiaris Consortio. That has been echoed by one orthodox bishop after another who has weighed in on Amoris Laetitia. As I noted earlier here, during this past weekend, TLM-friendly Bishop Philip Egan, Diocese of Portsmouth, England, who has been praised repeatedly by Traditionalists, added his name to the expanding list of bishops who have declared that Amoris Laetitia is orthdoox. Bishop Egan declared the following: "Has the Church’s teaching changed with Amoris Laetitia? No. Amoris Laetitia is totally consistent with Paul VI’s Humanae Vitae, with Familiaris Consortio of St. John Paul II and with the teaching of emeritus Pope Benedict XVI, and Francis frequently cites them." Cardinal Daneels made it clear enough, that C Jorge was falsely elected, therefore he is not a true Pope and that very much explains why he is anti catholic. "The idea that would consist in placing the Magisterium in a nice box detaching the Magisterium from pastoral practice which could evolve according to circumstances, fad and passions is a form of heresy, a dangerous schizophrenic pathology. I affirm solemnly that the Church of Africa will firmly oppose every rebellion against the teaching of Christ and the Magisterium." Now would be a good time for the Church in Africa to clearly speak out against Amoris Laetitia and support Bishop Schneider's request for absolute clarity on this Papal Exhortation. The faithful need a definitive answer as to whether or not divorced & remarried together with cohabiting couples (heterosexual/homosexual) will henceforth be able to receive Holy Communion. To Mark Thomas: Maybe this will help you. Michael Dowd said..."The following is a quote from our esteemed Cardinal Sarah: "The idea that would consist in placing the Magisterium in a nice box detaching the Magisterium from pastoral practice which could evolve according to circumstances, fad and passions is a form of heresy, a dangerous schizophrenic pathology. I affirm solemnly that the Church of Africa will firmly oppose every rebellion against the teaching of Christ and the Magisterium." Thank you. Should Cardinal Sarah accuse His Holiness Pope Francis of such a rebellion in regard to Amoris Laetitia or otherwise, then I would pay attention to the Cardinal's argument. However, the mere fact that somebody claims that another person has rebelled against God doesn't turn that claim a fact. For example, there are "Super Trads" who fancy themselves as the only real Catholics on earth. They insist that along with each Pope since Venerable Pius XII being "false," that the entire episcopate is heretical. They accuse Cardinal Sarah of heresy.. The mere fact that a priest was ordained via the Novus Ordo suffices for Super Trads to label priests as heretics. Bishop Fellay is a heretic, according to Super Trads. Accusing somebody of having rebelled against Jesus Christ doesn't mean much, does it? What the True Church has to say is of value. Mark, it appears that you are going to stick to the delusive narrative that Amoris laetitia has "changed nothing". "I can say, yes, period, but it would be too small a response." Mark, I appreciate the depth of the papalotry in which you find yourself, where a simple "yes, period" is understood to mean "no". One thing Neo-con Catholics learned well during the prior two pontificates was blind obedience to the pope. That worked well for quite some time. The remarkable fact that both Cardinal Kasper and Bishop Schneider, prelates with diverse interpretations of theology, would agree that Amoris Laetitia leaves open the possibility of Communion for divorced and "remarried" Catholics, would give any reasonable person pause to reconsider that "nothing has changed" -- but not you.